eKapija continues to look into current events of significance to the economic environment through its new format – Topic of the Week. In the new edtiion to be published on September 24, 2018 titled Occupational safety and health we will look into the current trends in this area and the potential direction in further development. 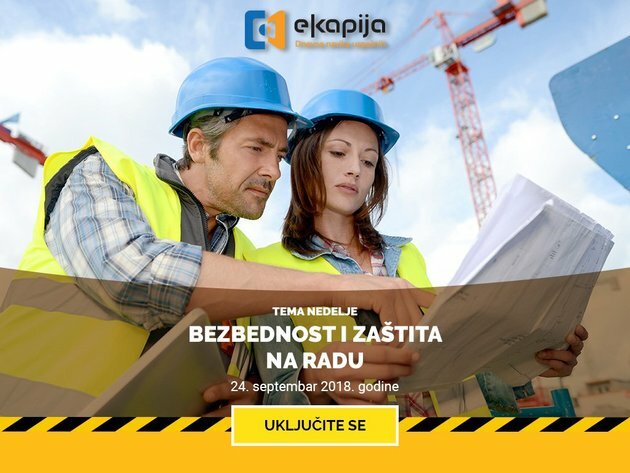 Every year more than 2,7 million people around the world lose their lives due to occupational diseases and injuries, In Serbia, 39 individuals succumbed to workplace injuries in 2017 only. These statistics upset the public but are also a reminder to all employers that they are obligated to provide safe working environment for their workers. Therefore many companies emphasize occupational safety as one of the basis of their operation and prioritize the health of their workers. Keeping in mind that most workplace injuries and occupational diseases can be averted, preventive measure are the most profitable way of treating occupational safety and health issues Consequently, business invest considerable funds into modern technological systems and devices but also educate their employees about adequate workplace conduct and safety measures. In the new Topic of the Week, eKapija will present safety procedures and regulations that will come into effect as well as the current legislation. You will also read about the new safety solutions and devices for incident prevention, necessary infrastructure and ways to protect buildings, products and workplaces. We invite you to join us in creating this edition if your job is related to occupational safety and health, management and employee education and manufacturing protection devices for buildings and workplaces. Send your suggestions to urednik@ekapija.com and marketing@ekapija.com.